A quote from the art historian, Jacob Burckhardt, introduces the great portrait exhibition currently at the Metropolitan Museum of Art. He tells us that fifteenth century Italy was, “the place where the notion of the individual was born.” Before this, portraits had been reserved for tombs and rulers, The show explores the concept of the portrait as a methodology to commemorate important people and remember family members much the way we use photography today, but also as a way to project ourselves as we would like to be seen. Keith Christiansen, John Pope-Hennessy Chairman of European Paintings at the Metropolitan Museum and Stefan Weppelmann, curator of early Italian and Spanish Painting at the Gemäldegalerie, Berlin are credited with putting this illuminating exhibition together with curator Andrea Bayer at the Metropolitan. They are responsible for conceiving and directing the show, but obviously, it takes many more to put on such a large exhibition. Therefore, we find about 200 acknowledgements in the exhibition catalog including 5 essay authors and 17 contributors to the 168 entries. Most exhibitions start off with a strong first gallery and this one is no exception. 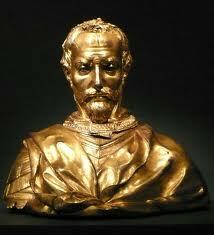 A most incredible gilded bronze bust by Donatello (circa 1386 – December 13, 1466) commissioned in 1425 as a reliquary for Saint Rossore, which resides today in the Museo Nazionale di San Marco in Pisa, greets us when we enter the room. In that same room we find a drawing representing the head of a cleric by Fra Angelico, who worked in Florence from around 1417 to 1455 from the Collection of Queen Elizabeth II. The image is so delicate it is easy to pass by without studying it, but don’t. It is absolutely lyrical. We are also introduced here to the concept that the profile was thought to show the most distinctive features of an individual. This theme is very important to the exhibition, especially when it comes to the medals which are inspired by ancient coins. There is a bit of confusion between using the standard exhibition technique of showing works of art in chronological order and using themes such as the Medici Family of Florence and then another gallery of the Portrait in Florence This is one of the reasons we find images by Botticelli in many of the galleries. But I must say these are well worth lingering over. Another artist who gets in depth study is Antonio di Puccio Pisano, more easily remembered as Pisanello (1395- circa 1455). 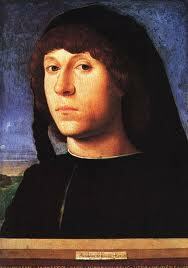 He was the most praised portraitist of the early Quattrocento. His murals, his drawings and his medals, mostly of individuals, caused him to be sought out by all who could afford him. His portrait medals in profile were most highly prized. 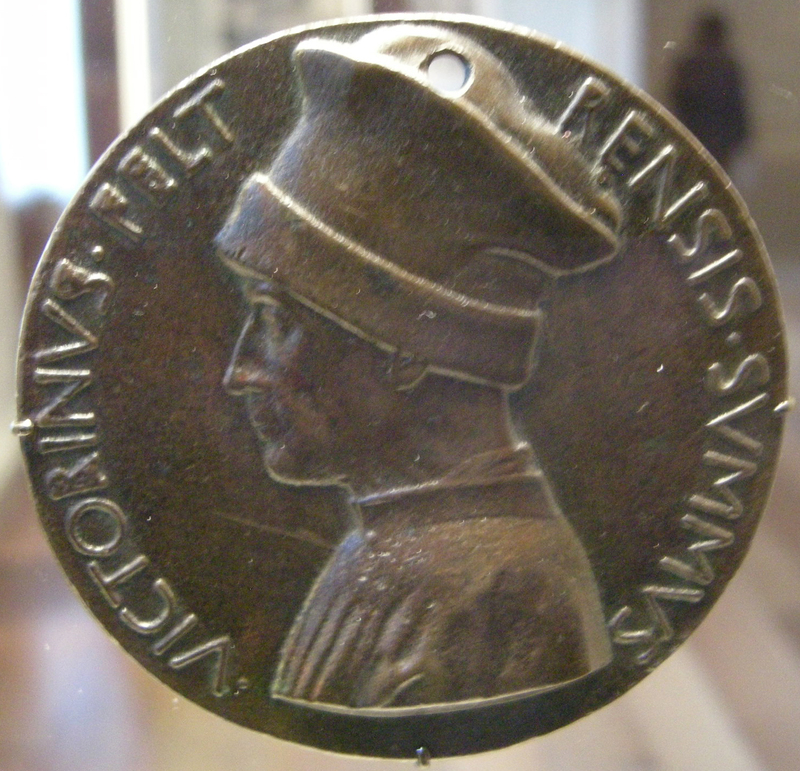 Note the medal of Vittorino da Feltra from a private New York Collection. The dark gallery created in deference to the sensitive works on paper also allows the paintings to shine and the medals to glow. The following gallery I must admit was also somewhat confusing. It showed court portraits in both paintings and many sculptures but for me they did not all hold up to the quality of the rest of the show. Also, in this room there is a wall label speaking of the great influence that the art of Flanders had on portraiture by the end of the fifteenth century though there is only one small Flemish painting in this large room. The final gallery, however, makes up for this and fully demonstrates the relationship between the art of the North and South. 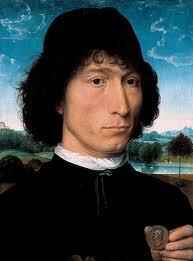 Note this image of “A Man with Roman Coin” by Hans Memling (ca. 1433-1494) painted between 1471 and 1474 from Antwerp and the “Portrait of a Young Man” by Antonello da Messina (1439-1479) painted circa 1478 from Berlin. When I passed the reading room on two different occasions I was impressed by the fact that all 16 chairs were filled with young and old studying the catalog and only one out of all of them was just resting. For me an exhibition can be considered a success when so many who see it wish to learn more, and the works of art in this exhibition certainly deserve study.